This recipe is a combination of the Lemon Cashew Cream sauce and the Spicy Lemon Pepper Pasta with Broccoli from Vegan Yum Yum. She uses the lemon cashew cream sauce with her gnocchi, but we've had it on regular pasta and it's delicious. If you want the original recipe for that, go here. We've also had her spicy lemon pepper pasta with broccoli and it's delicious as well. However, it uses olive oil to coat the noodles and I'm not crazy about that (tastes good, not so healthy). Find that original recipe here. Anyway, I was messing around with my new blender (a Blendtec) and decided to make a pasta sauce with these two dishes in mind. It turned out quite wonderfully, if I do say so myself. • Zest the lemon. Reserve zest and then peel and quarter the lemon. • Add all ingredients (including the lemon zest and peeled lemon quarters) to your blender. • Blend until completely smooth and hot**. 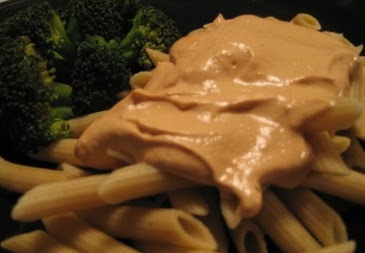 • Serve with whole grain penne pasta and broccoli (either on the side or mixed in). * This makes the sauce pretty lemon-y. We really liked it, but you may want to start with 1/2 of a lemon and add more if you'd like. I'd still use the zest from the whole lemon, though. ** The sauce should still get pretty creamy with a normal blender - it just won't heat up unless you have a Vita Mix or a Blendtec.